Animation is a great activity to do with children and it can support so many areas of the curriculum. It works well with a PC and connected web-cam (and we’d suggest you use Zu3D if you can run to it. 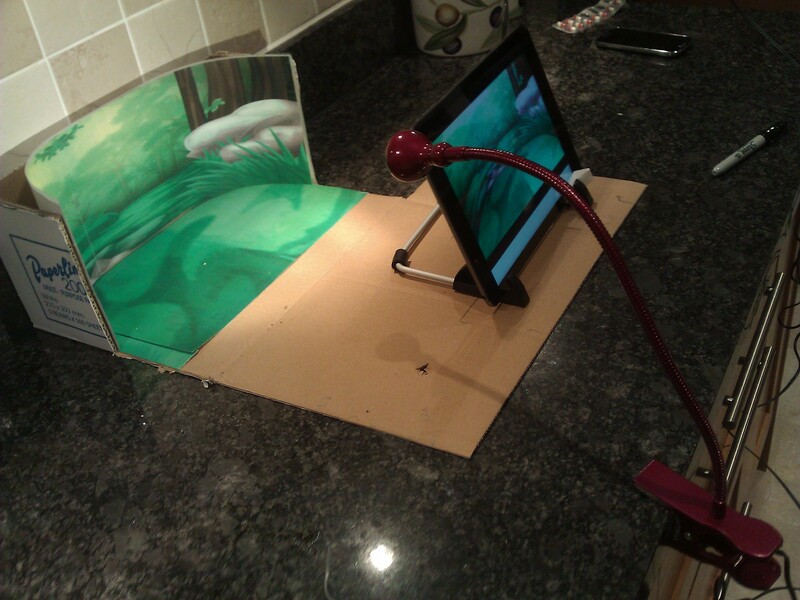 But increasingly schools are using iPads for animation. We’d recommend the simplicity of I Can Animate (or Animate It – the same thing) then save to the camera roll and import into iMovie to add narration, music, titles, credits …. LEGO Movie Maker is also good (and free). A good way to work is to use those boxes that your A4 photocopier paper arrives in. Just break down one of the long sides and use the remaining one (which you can cut down to make it easier to get hands in) as the backdrop and the bottom of the box as the stage. The iPad can be stuck down onto the flattened side. Children can design their own backgrounds or here are some ready to be printed on A3 paper. Animation in a box iPad backgrounds. We have a large supply of the desk lamps and iPad stands pictured above for you to borrow – just let us know. Plasticine is great for animation but can be time consuming. Consider using LEGO. We have a class set of the LEGO Story Starter kit.